Intracranial ependymomas are the third most common primary brain tumor in children and are usually located in the posterior fossa. , Supratentorial ependymomas are rare. Recent data suggested that these tumors may have different biological and clinical behaviors according to their location. To date, many studies group together infratentorial and supratentorial ependymomas, whereas some studies of supratentorial ependymomas frequently include adult population. Besides that, data on the expression of proliferation and apoptosis regulators in supratentorial ependymomas are scarce. In the present study, we retrospectively studied supratentorial ependymomas in children in conjugation with Ki-67, p-53, p-27, bcl-2, EGFR, and neuronal markers expression. We retrospectively studied supratentorial ependymomas that were treated surgically in our institute over the last seven years. The extent of resection was classified as gross total and subtotal and was determined by comparing MRI scans obtained before surgery with those after resection. The ependymal tumors were classified according to World Health Organization. Progression-free survival (PFS) was defined as the time from the initial surgery to the date of evidence of tumor progression confirmed radiologically. Overall survival (OS) was calculated as the time from surgery to death or as the time to the last follow-up appointment of the surviving patients. The study was approved from the institutional review board. Four-micrometer-thick, formalin-fixed, paraffin-embedded tissue sections were immunostained using the streptavidin-biotin-horseradish peroxidase (HRP) method (Supersensitive Multilink Kit QD0005L; Biogenex, San Ramon, CA, USA). Deparaffinized sections were rehydrated through graded series of alcohol and then microwaved in 0.1 mol/l sodium citrate buffer solution (pH 6.0) for 3 × 5 min at 450 W to unmask antigen epitopes. After treatment with 3% hydrogen peroxide for 5 min to block endogenous peroxidase, the sections were subsequently incubated with the primary antibodies [Ki-67/MIB-1 (clone MIB-1, dilution 1/50, DAKO, Denmark), p-53 (clone DO-7, dilution 1/50, DAKO, Denmark), bcl-2 (clone 100/D5, dilution 1/50, Novocastra/Leica, UK), p-27 (clone 1B4, dilution 1/20, Novocastra/Leica, UK), EGFR (clone epidermal growth factor receptor 25)], Synaptophysin (clone SY38, Monosan, Sanbio), Neurofilaments [clone 2F11 (70 + 200 kda), Monosan, Sanbio], Neu-N (clone A60, Chemicon, Millipore), and b-tubulin III [clone TU-20, serotec) for 50 min at room temperature. Afterward, the sections were incubated with ready-to-use biotin-labeled secondary antibody and streptavidin peroxidase for 20 min each. Tissues were then stained with 0.05% 3,3-diaminobenzidine tetrahydrochloride diluted in DAB substrate and then counterstained with hematoxylin, dehydrated and mounted. Tris buffer solution (pH 7.6) was used for rinsing the sections between incubation steps and the dilutions of primary antibodies. The immunohistochemical expression of Ki-67, p-53, bcl-2, p-27, and EGFR were evaluated by two independent experienced neuropathologists. Results were expressed as the percentage of positive tumor cells out of the total number of counted cells (approximately 3,000 counted cells) in the highest density of stained areas. All cells with staining of any intensity were considered positive, irrespectively of staining intensity. Any discrepancy between the two physicians was solved by consensus. Nine children (3 males, 6 females, mean age 6.9 years, range 10 months to 13 years) were identified and included in the study. In eight cases, the tumor was lobar without relation to the ventricular system, and in one case, the tumor was intraventricular. Headache and seizures were the most common presenting symptoms and papilledema the most common sign. The mean symptom duration was 8.3 weeks. [Table 1] summarizes patients' presenting symptoms, tumor localization, size, histology, time to recurrence, and follow-up. In seven cases, gross total excision was performed, and in two cases, the resection was subtotal [Figure 1]. Postoperative in one case, there was mild left-sided hemiparesis that gradually resolved and simple partial seizures that were medically controlled. All ependymomas were anaplastic, and all patients received local radiotherapy and adjuvant chemotherapy, apart from one child under the age of three that received chemotherapy alone. Ki-67/MIB-1 was detected heterogeneously in 20-40% of the nuclei in all tumors. P-53 protein was also detected in all ependymomas (range 20-30%), showing a parallel with Ki-67 expression. Bcl-2 protein was also detected in all tumors (range 5-50%). There was expression of p-27 and EGFR in all stained cases. There was expression of neuronal markers in three cases. 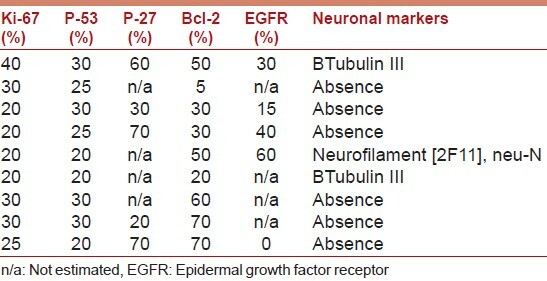 [Table 2] summarizes patients' immunohistochemical data. After a mean follow-up period of 32.1 months (range 16-74 months), eight children were alive. The deceased patient died because of respiratory infection. Five children suffered from tumor recurrence. Three local relapses were treated by surgery with chemotherapy and two with stereotactic radiotherapy. The mean time for recurrence from the original operation was 23.4 months. All five children achieved disease remission. The prognostic significance of ependymoma grade is dubious. Thus, a better understanding of cell-intrinsic mechanisms and pathways involved in tumor growth may lead to better tumor classification and prognosis assessment. In a previous study, we found high Ki-67, p-27, and EGFR expression in infratentorial ependymomas. P-27 is a member of the cip/kip family of cyclin-dependent kinase (CDK) inhibitors that negatively control the cell cycle progression. High p-27 expression suggested that p-27 may be rendered non-functional through interaction with other cell cycle regulator proteins. Furthermore, EGFR has a crucial role in tumor proliferation and spread by promoting cell cycle. High EGFR expression has been associated with adverse prognosis. EGFR may also serve as a therapeutic target. In this study, there was increased EGFR expression in nearly all stained cases. P-53 and bcl-2 expression has been also correlated with tumor's aggressiveness. In our study, due to the limited number of cases, no correlation with patient's prognosis could be made. To conclude, ependymomas should be included in the differential diagnosis of large heterogenous supratentorial lesions. Complete surgical excision should be the goal of surgery. Nevertheless, even after complete excision, close follow-up is mandatory. The prognostic role of Ki-67, p-53, p-27, bcl-2, and EGFR needs to be determined in multi-institutional studies due to tumor's rarity. 1. Alexiou GA, Moschovi M, Stefanaki K, Sfakianos G, Prodromou N. Epidemiology of pediatric brain tumors in Greece (1991-2008). Experience from the Agia Sofia Children's Hospital. Cen Eur Neurosurg 2011;72:1-4. 2. Alexiou GA, Stefanaki K, Moschovi M, Patereli A, Prodromou N, Karentzou O. Immunohistochemical expression of cell cycle/apoptosis regulators and epidermal growth factor receptor in pediatric intracranial ependymomas. J Child Neurol 2011;26:195-8. 3. Andreiuolo F, Puget S, Peyre M, Dantas-Barbosa C, Boddaert N, Philippe C, et al. Neuronal differentiation distinguishes supratentorial and infratentorial childhood ependymomas. Neuro Oncol 2010;12:1126-34. 4. Zamecnik J, Snuderl M, Eckschlager T, Chanova M, Hladikova M, Tichy M, et al. Pediatric intracranial ependymomas: Prognostic relevance of histological, immunohistochemical, and flow cytometric factors. Mod Pathol 2003;16:980-91. 5. Schneider D, Monoranu CM, Huang B, Rutkowski S, Gerber NU, Krauss J, et al. Pediatric supratentorial ependymomas show more frequent deletions on chromosome 9 than infratentorial ependymomas: A microsatellite analysis. Cancer Genet Cytogenet 2009;191:90-6. 6. Venkatramani R, Dhall G, Patel M, Grimm J, Hawkins C, McComb G, et al. 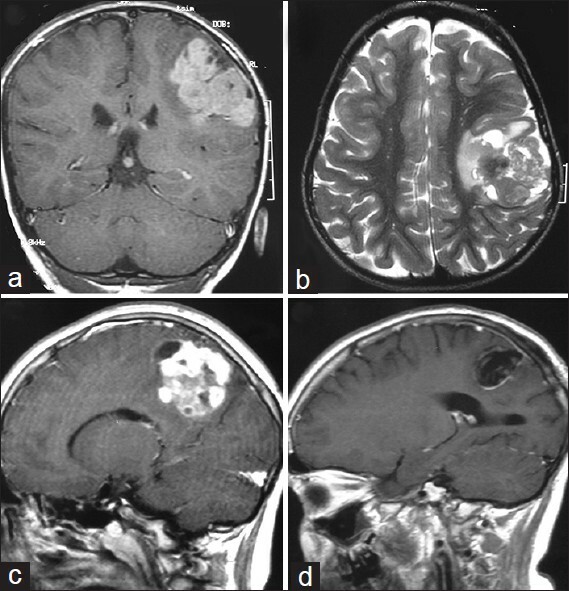 Supratentorial ependymoma in children: To observe or to treat following gross total resection? Pediatr Blood Cancer 2012;58:380-3. 7. Kawabata Y, Takahashi JA, Arakawa Y, Hashimoto N. Long term outcome in patients harboring intracranial ependymoma. J Neurosurg 2005;103:31-7. 8. Metellus P, Figarella-Branger D, Guyotat J, Barrie M, Giorgi R, Jouvet A, et al. Supratentorial ependymomas: Prognostic factors and outcome analysis in a retrospective series of 46 adult patients. Cancer 2008;113:175-85. 9. Pollack IF, Gerszten PC, Martinez AJ, Lo KH, Shultz B, Albright AL, et al. Intracranial ependymomas of childhood: Long-term outcome and prognostic factors. Neurosurgery 1995;37:655-66. 10. Kumar R, Singhal N, Jaiswal SK, Mahapatra AK. Recurrence in supratentorial anaplastic ependymoma. Pediatr Neurosurg 2007;43:364-8. 11. Mansur DB, Perry A, Rajaram V, Michalski JM, Park TS, Leonard JR, et al. Postoperative radiation therapy for grade II and III intracranial ependymoma. Int J Radiat Oncol Biol Phys 2005;61:387-91. 12. Mendrzyk F, Korshunov A, Benner A. Identification of gains on 1q and epidermal growth factor receptor overexpression as independent prognostic markers in intracranial ependymoma. Clin Cancer Res 2006;12:2070-9. 13. Verstegen MJ, Leenstra DT, Ijlst-Keizers H, Bosch DA. Proliferation- and apoptosis-related proteins in intracranial ependymomas: An immunohistochemical analysis. J Neurooncol 2002;56:21-8. Alexiou, G.A., Stefanaki, K., Prodromou, N.